We invite you to experience the allure of the Champions Club. Located on the Club Level between sections 210-214 at the North end of PNC Arena, the Champions Club overlooks the arena floor. Accessible only to Champions Club ticket holders, guests are invited to enjoy the excitement, entertain, and relax in a private setting. Exclusive amenities and benefits are extended to all Champions Club ticket holders, including all-you-can-eat food stations, a full-service bar, and a private lounge area. 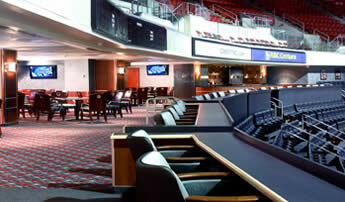 The Champions Club is most easily accessed by using the East or West Entrance of PNC Arena. Staff members at these entrances will verify your ticket and direct you to the escalators. Take the escalators to the Club Level and as you exit the escalators, the Champions Club is just around the corner. For more information on the Champions Club or other Carolina Hurricanes ticket packages, please fill out the form below.